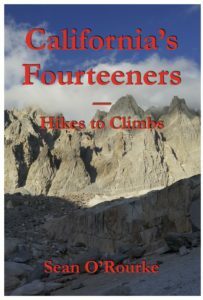 This book is intended as a guide to California’s fourteeners for someone comfortable on moderate, established routes like Whitney’s trail and the easier Colorado fourteeners. The ideal reader should be reasonably fit and eager to explore, but may have less experience and confidence route-finding off trail and on steeper terrain. This book presents the most common routes on California’s fourteeners, and how to climb them in order of progressive difficulty, from hikes on well-maintained trails to steep, exposed scrambling. Status May 8, 2018: The second edition has sold out. As an experiment, I am offering an electronic version for $12. There are actually two versions: the original 6×9, suitable for reading on a screen, and a 2-up 8.5×11 version suitable for printing at home. If you are interested, send me $12 via either PayPal or some other means (email for a mailing address), and let me know which version you want. I will email you a download link.